When we got ready to make the trip, my husband informed me that I would have get everything for the trip into a carry-on roller bag and a backpack. He promised me that we would do wash halfway through the trip. We had these faithful traveling companions. 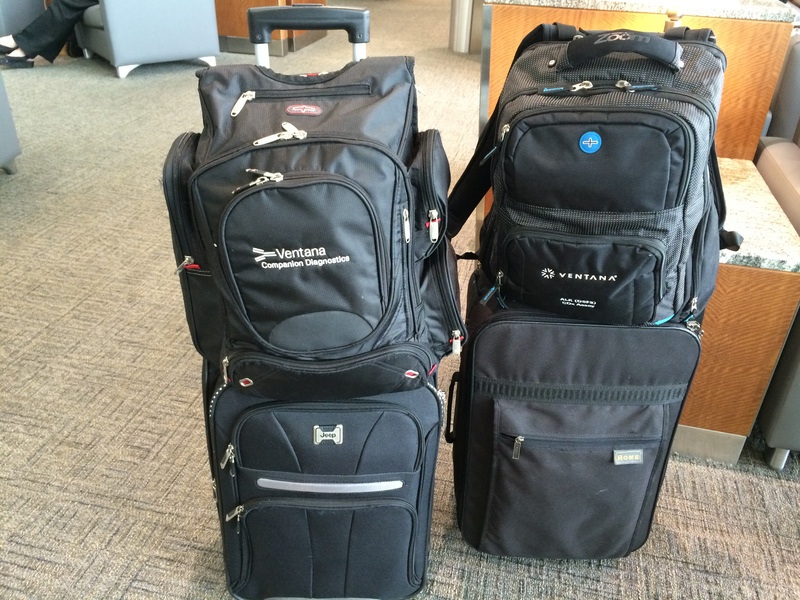 Thankfully our daughter provided us with these marvelous backpacks to go along with our roller bags. We saw a lot of magnificent churches. 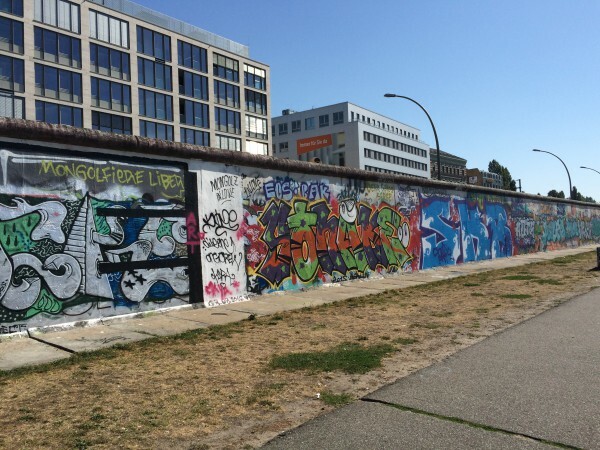 The one in Passau, Germany was my favorite. Photos can’t capture all the beauty of this cathedral. The carvings and paintings all told a story. I loved the guide’s explanation of how the pillars are very plain at the bottom, representing things here on earth. As your eye goes up the pillars, they become increasingly ornate until you see the intricate carvings and paintings that represent the glories of heaven. We listened to an organ concert here. 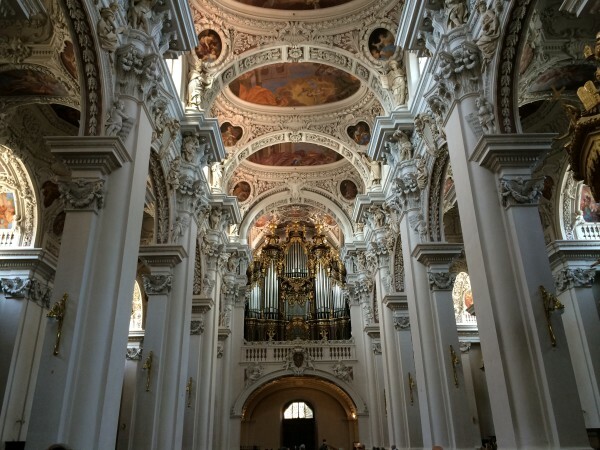 In the photo, you can see some of the pipes of the huge organ. 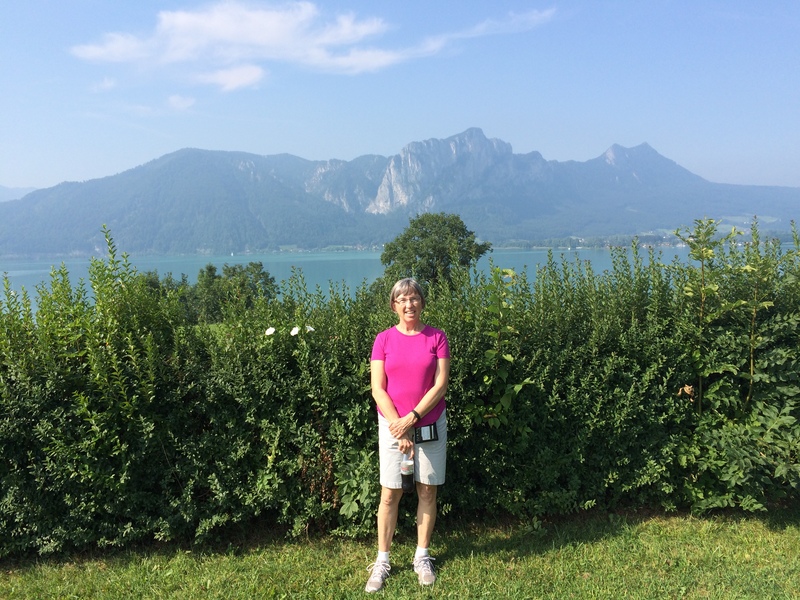 On our trip to Salzburg, we stopped for a bathroom break and my hubby took this photo. The scenery was beautiful and the bathrooms were free. Having to pay to pee was one of the low lights of this trip. Another low light was the weather. We live in hot Arizona and were looking forward to some cool European weather. What did we find? A heat wave with temps 95 to 102 degrees for the first ten days. 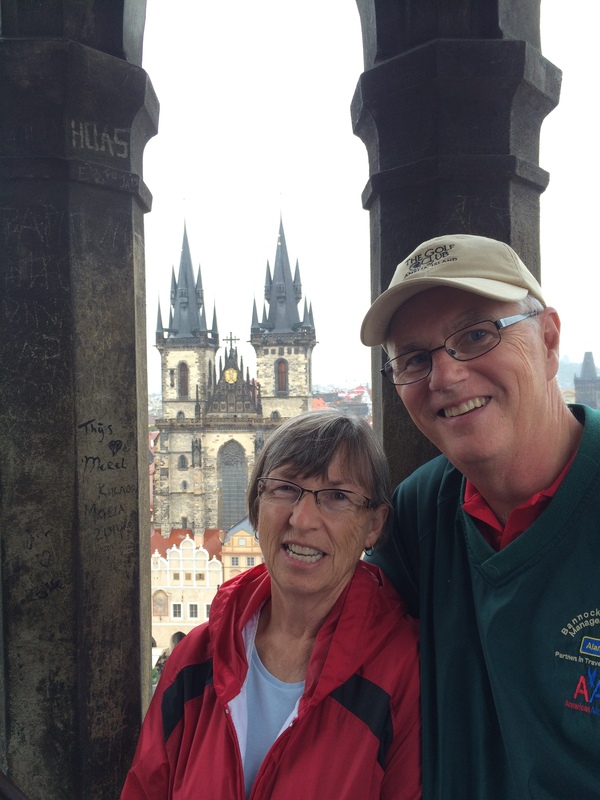 The day we arrived in Prague the heat wave broke, but that meant two days of rain. It was not fun trudging through the city in the rain, but we still look happy despite the gray day. 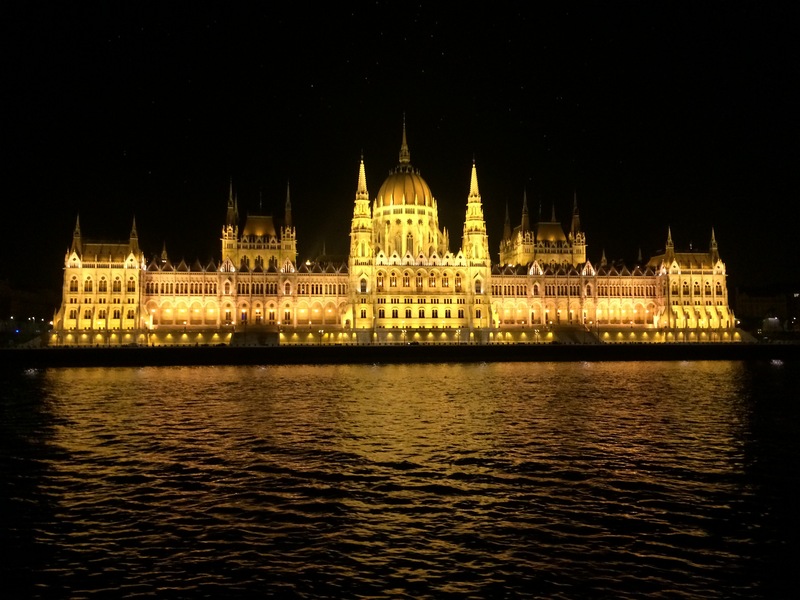 Budapest was a highlight and my favorite city of all those we visited. We sailed into Budapest at night. Here’s what greeted us. As a romance author, this custom in the photo fascinated me. Locks on the bridge. 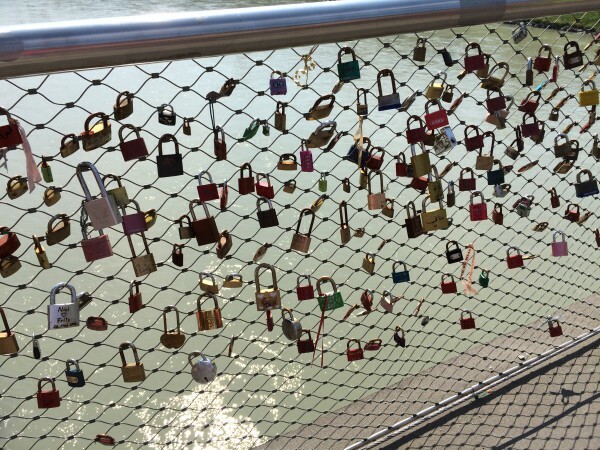 Couples buy the locks and put their initials or names on them and then lock them on the fencing that runs along the side of the bridge to symbolize their lasting love. I took over 700 photos on this trip, so it’s hard to pick only a few to share. These last three are a some of my favorite things from the trip. A portion of what is left of the Berlin Wall. Not my favorite city. I encountered my only pick pocket here on the train to our hotel. Fortunately, he didn’t get anything. He tried to unzip a pocket on my backpack. He picked the wrong one because he would only have gotten my jacket or my nightgown, but it shook me up that he tried to take something from me. And finally a fairy tale ending. Neuschwanstein Castle. If you’d like to win a copy of my latest book, NURSING A SOLDIER’S HEART, please leave a comment which includes your e-mail address. Carrie, we had a fabulous time and saw so much. Merrilee, what amazing pictures! Thank you for sharing them with us. I think my favorite is the cathedral. I wonder if you’ll set a novel in Europe sometime, after such inspiration? This sounds like an amazing trip! Was it a guided tour? A river cruise? Or did you guys pick your own itinerary? Valerie, it was half and half. 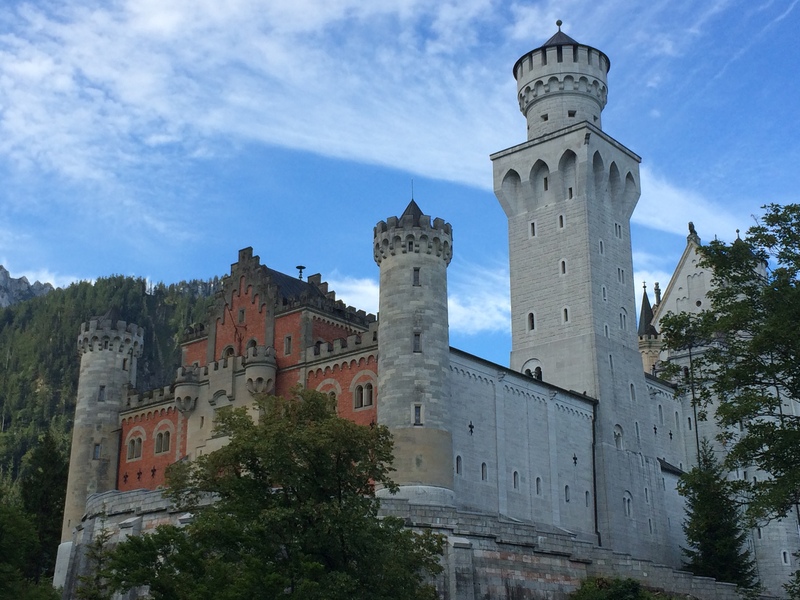 We were taking a river cruise on the Danube, but we flew in a couple of days early to tour Munich. Then after the cruise we had another week on our own to visit Vienna again and also see Prague in the Czech Republic and Fussen in Germany. We did all this traveling by train. Samantha, I’ve been to Rome and would love to go to the Holy Land, too. Canada has a lot of neat places to visit. Loved hearing about your amazing trip and enjoyed your pictures. Your book sounds really good and I would love to win a copy. Ann, I’m glad you enjoy hearing about my trip. We had such a good time. I loved this post. Thanks for sharing your pics. I especially enjoyed learning about the symbolism of the pillars. Very cool! I’m glad that pick pocketer didn’t succeed. Did you stop him in the act? Kimberly, I’m glad you enjoyed hearing about the symbolism of the pillars. I thought that was so unique. As far as the pickpocket goes, I didn’t realize what was happening at first. The train was very crowded, and of course, we had been warned about pickpockets in crowd. This guy was facing me when we came to a stop. He and several others started to move to the door. I tried to move my suitcase out of his way, but he kept bumping into me. I realized what he had tried to do as he scrambled off the train. If I’d caught him in the act, I would have yelled at him. Autumn, after I took that photo, I saw other bridge where people had done the same thing. The pickpocket has to make it into your next book! Given that it turned out okay, a pretty exciting story to tell. Thanks for sharing the pictures, and the message regarding the pillars in the church. I’m sure I would never have figured that one out on my own! Diane, that’s the beauty of travel. You get a lot of ideas. I’m glad the guide explained the pillars. It made it even more beautiful knowing the symbolism. 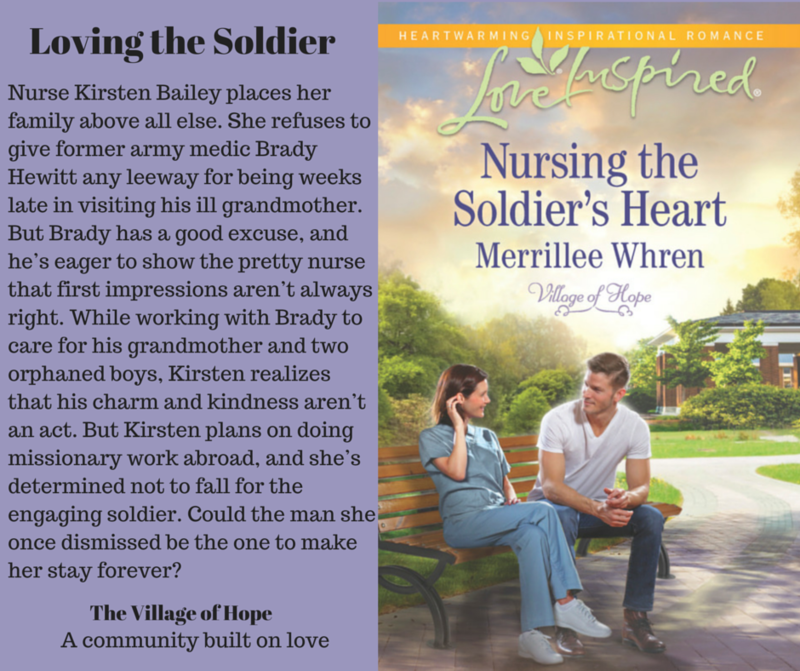 Would love to win a copy of your book, Merrillee!! Love this post and the pictures. I have been researching my family ancestors. They came from Ronshausen and Meckbach Germany. I would love to go over there sometime and see where they lived, see if there were still relatives living there that I don’t know about. Thanks for sharing your trip! Sally, my ancestors were German also, but when my grandparents emigrated to the US, they came from Russia. It’s my understanding that they went to Russia to avoid some political persecution, then left Russia for the same reason. They must have been rabble-rousers. :) I wish I had been more curious about family history when they were alive. So I would know more than bits and pieces. When my sister and I were growing up, before mom and dad divorced when I was in 3rd grade, we always thought dad was an only child and his father was an only child. Come to find out his dad had two siblings! I can’t find anyone that will talk to me though. They still live in the area around I think it’s Burk’s County PA. When dad died, I got the genealogical research that his aunt had done on his mom’s side of the family. It went all the way back to a baron! Some ancestors came over with William Penn. There are a lot of stories to tell on this side of the family. They are related to William Rittenhouse, who ran the first papermill. The Townsend apple was named after one of the ancestors. After dad died, I’ve worked on his part of the family. There were rumors we were related to Olive Schreiner, the writer from South Africa. Her father was a German missionary from Fellbach Germany. I’ve made it back to ggggg grandfather and they are still in Ronshausen! I can’t make the connection yet, but I’m trying. I did come across a family member who had a copy of the front of the Bible where they write in births, deaths, and marriages. It was from the wife of the son who came over from Germany. It would be so much easier if someone were still alive to help me, but dad didn’t know anything. When I would ask questions, he knew nothing. I think after his mom died and the aunts, the family didn’t stay in touch as much. I’ve seen another city that did the locks on the fence. I don’t remember where it was, but they had to take it down due to the weight of all the locks! What fun to see this one in person :-) And, I too love all the pictures you posted here and on Facebook. 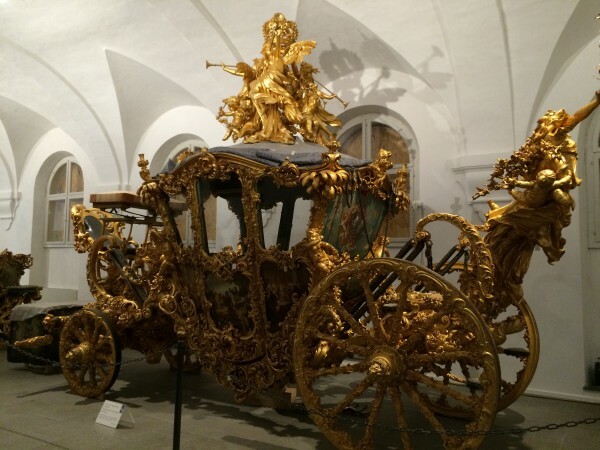 My favorite is that royal carriage, can you imagine riding down the street in that…wow!! Not to mention that beautiful castle!! And yes, I agree with Diane, that pickpocket needs to be in a story! How scary that must have been, though! So glad that it turned out okay, it could have been far worse. Glad you had an amazing trip and made memories with your husband! One day, I hope to go to Germany with my own husband making those beautiful memories! Hi Merrillee. The photos are beautiful. I am thankful you were not harmed by the pickpocket. I have to give a little chuckle here…can you imagine him getting away with your nightgown and running down the street with it flowing out behind him? That would make a funny twist to a story. My family traveled to the Tetons for the first time this May. The symbolic majesty of the churches you mentioned reminded me of God’s majesty we saw in nature. I felt like I was in a cathedral while there. Praise God for good and safe trips. Please enter me into your contest at beechtreehollow@yahoo.com. Trixie, we always had to be sure to have change for the restrooms or wait until we ate a meal at a restaurant where most of the bathroom were free. I imagine this was a trip of a lifetime. Never gone a a really fun trip. Guess thats why I read a lot of fun books. Thanks for the chance to win.